Between our garden, my Mystery Box from Mariquita Farm, and my inevitable (and beloved) trips to the farmer’s market, I had more vegetables than I knew what to do with this past week. Among them were some red bell peppers, a gorgeous dark purple Italian eggplant, several bushes of basil, and the best tomatoes in the world, tiny orange Sungold tomatoes. 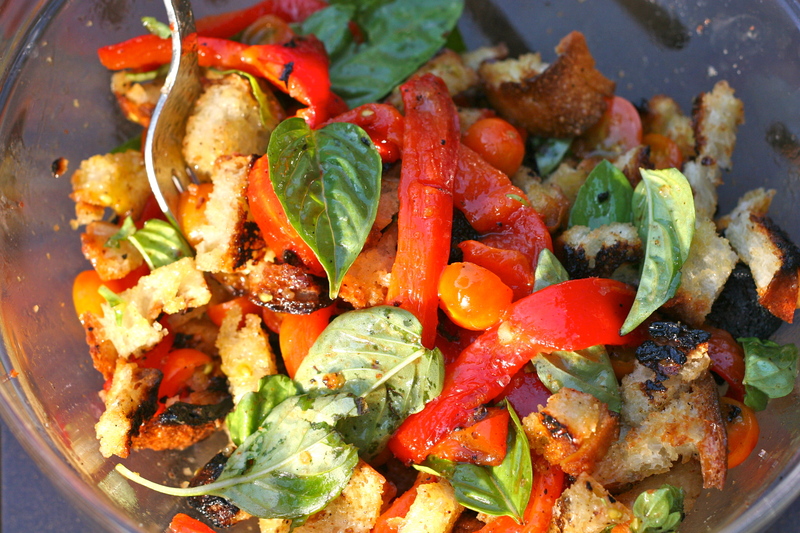 With a couple of loaves of my favorite ciabatta bread on the counter, I immediately thought of panzanella. The first panzanella I tasted resembles this version like a cookie resembles a granola bar. Not much. My husband was put to work by my Northern Italian relatives in making a very Southern Italian dish. It involved the stalest of bread, sliced before hardening, freshly diced tomatoes, garlic, basil, salt, and olive oil, and not much else. He was instructed to dip the rock hard slices of bread into the delicious slurry and then hand-squeeze out the excess juice before layering the soaked, aged bread on a platter, drizzled with the remaining sauce. It was marvelous, but it took a while. My panzanella is much quicker, can be made without much forethought (i.e. 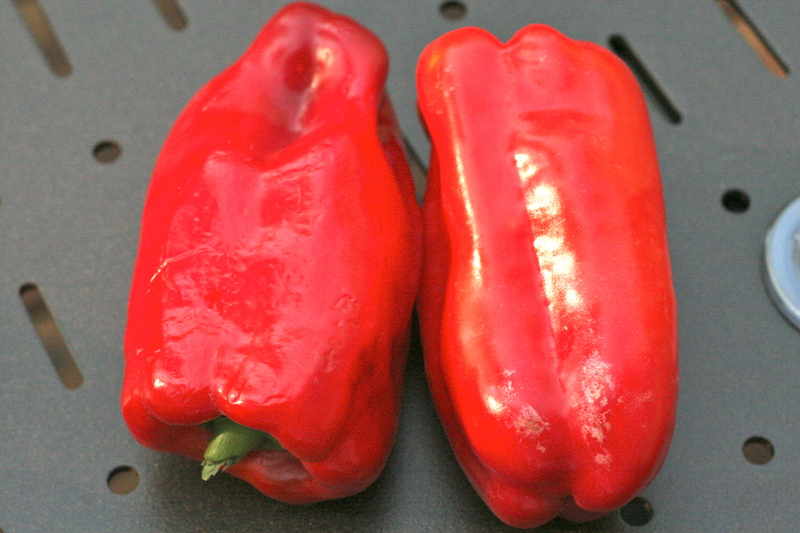 no planning to harden the bread days in advance), and sometimes includes a couple of sweet roasted bell peppers (capsicums). If you decide to go with a grill plan for dinner, the panzanella and the eggplant serve as a filling vegetarian meal. If you want to add some ribs or lamb with it, then the time that the veggies and ciabatta occupy the grill is minimal so you can do everything swiftly. Start by roasting the bell pepper until the skin is puffed and blackened in spots and then toss it into a food-safe plastic bag to rest for a couple of minutes before peeling it. While it is resting you can grill the eggplant and finally the ciabatta toasts (be careful, they burn quickly if you put them on too high heat). 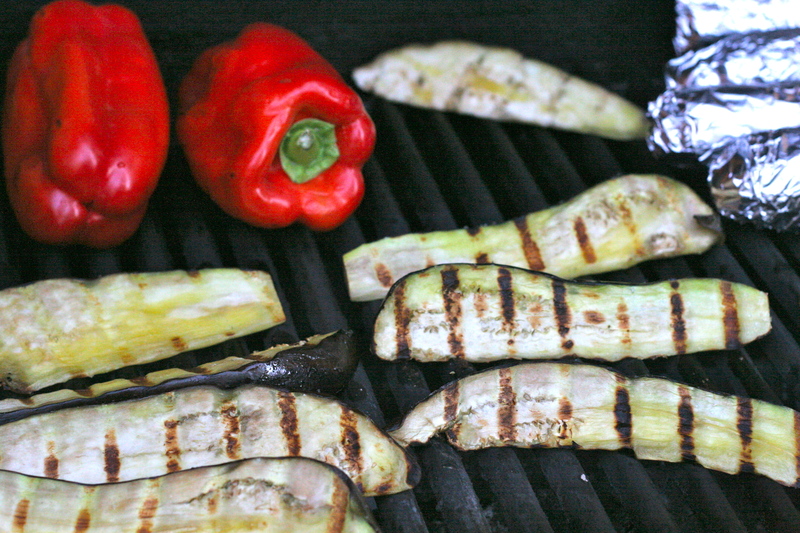 The eggplant takes no more than 4 or 5 minutes per side, depending on how thickly you slice them. 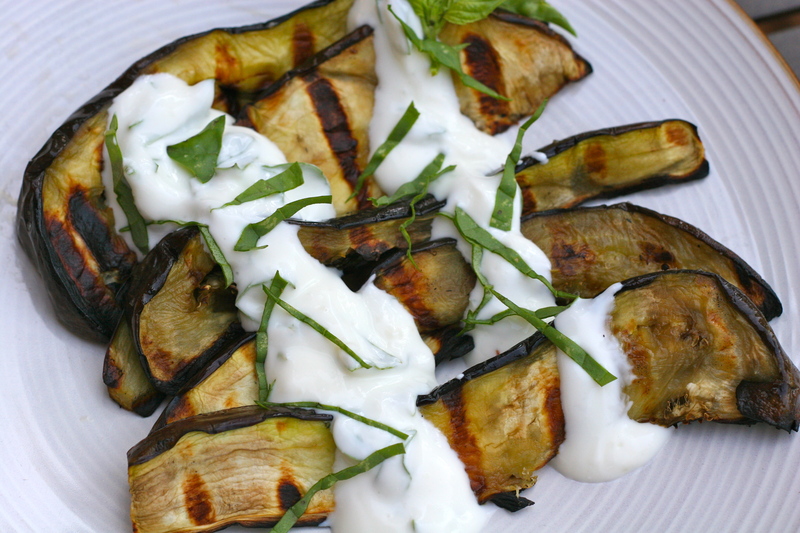 The eggplant tastes great either hot from the grill with the cool basil-yogurt sauce spooned over the top, or at room temperature. It is a flexible barbecue dish. Finally, if you felt like adding more to the eggplant dish, something crunchy like pine nuts, pumpkin seeds, or even toasted almonds would taste delicious atop the yogurt sauce, but I do not find it necessary, especially if you are serving this with the panzanella, which has the crunch of the grilled ciabatta bread. If you really want to emphasize the sour tang in the sauce, a sprinkle of sumac powder would be tasty too. These are two of my absolute favorite summer dishes because they showcase the inherent beauty and flavor of the tomatoes, basil, peppers, and eggplant. Enjoy. They will not last long on your table before you (or someone else) devour them, hence no extra pics of the eggplant dish. Preheat the grill to medium high or an oven to 450F degrees. Roast the bell pepper, turning once or twice until it is charred in places and the skin looks puffed, about 10-15 minutes on the grill and about 15-20 minutes in the oven. Seal into a food-grade plastic bag and let rest for 5-10 minutes before peeling, then open it up, remove the core and seeds and slice the whole pepper into long thin strips. While prepping the bell pepper slice a couple of the larger tomatoes (or all of them if they are not cherry tomatoes) into halves and add 2 tablespoons olive oil, and the pressed garlic clove. 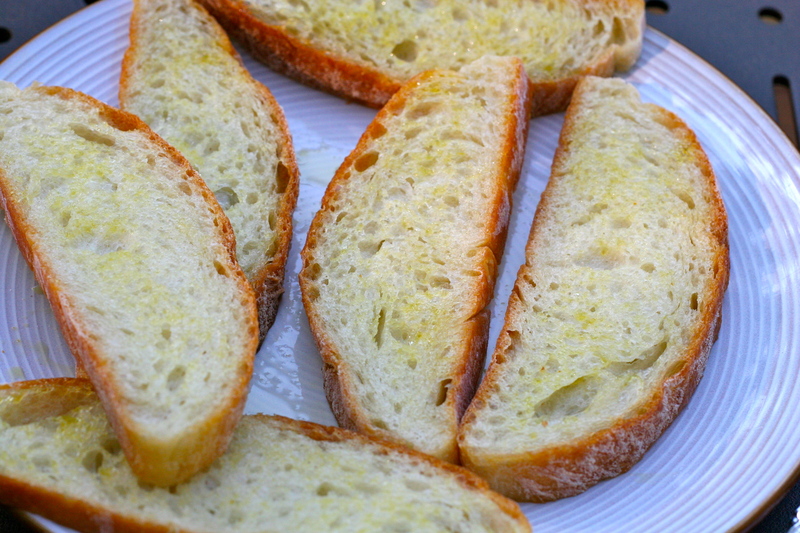 Brush both sides of each slice of ciabatta bread with a little olive oil and then grill on the grill for about 1 minute per side. Pay close attention since they burn quickly. 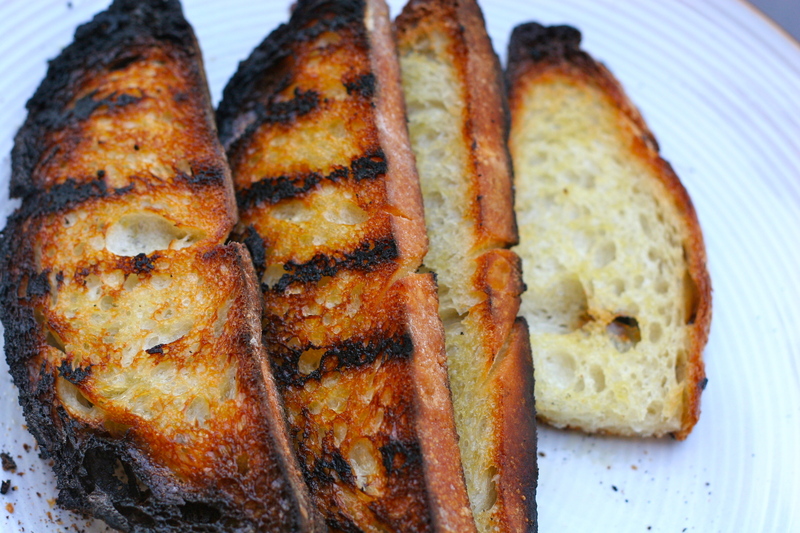 Remove from the heat and then roughly cut each grilled bread slice, crosshatch fashion into bite sized pieces. If they are crunchy enough you could just break them by hand. 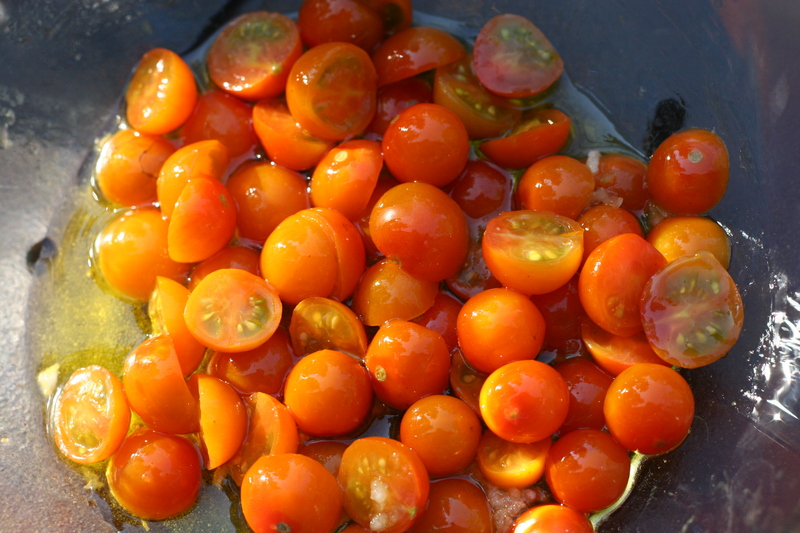 Add to the bowl with tomatoes and olive oil, and then add the basil, pepper slices, and salt to taste. Mix very well so the juices combine and then serve. Heat the grill to medium-hot. Slice the eggplant lengthwise into pieces no more than 1 1/2 inches thick, sprinkle loosely with about 1-2 teaspoons kosher salt, and let rest in a colander while you prepare the sauce. Crush one clove of garlic and add to the yogurt along with salt to taste. Stack the basil leaves and then slice them thinly (chiffonade). Add to the sauce and refrigerate until ready to use. 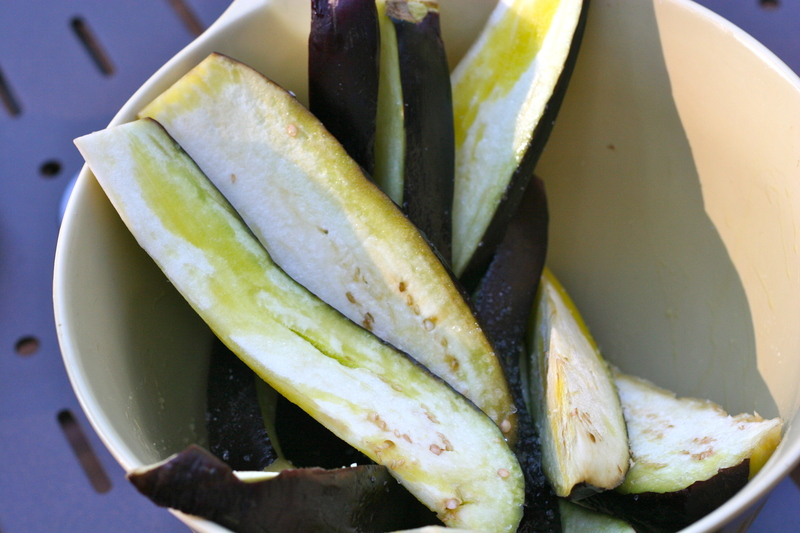 Dab each eggplant slice with a paper towel and then lightly brush with extra virgin olive oil. Grill each side for 4-5 minutes until they can be pierced with a fork. Taste for salt and add more if needed. Set on a platter and drizzle with the yogurt sauce or allow guests to add their own. This entry was posted in Dinner, Salad, Vegan and tagged basil garlic yogurt sauce, grilled eggplant with basil yogurt sauce, grilled panzanella recipe, panzanella with bell peppers and sungold tomatoes. Bookmark the permalink.